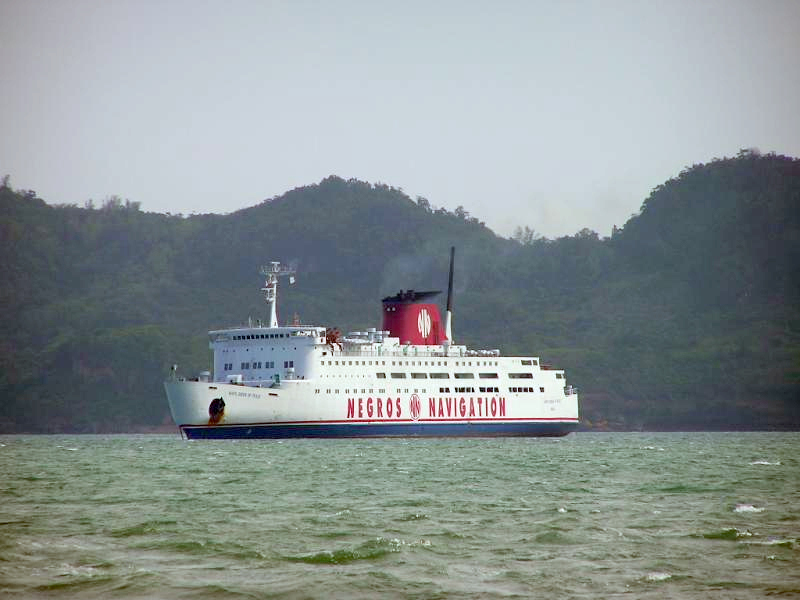 The “Mary, Queen of Peace” of Negros Navigation holds the distinction as the ferry that held the highest total horsepower among liners in the inter-island trade in the Philippines at 36,000 horsepower. However, she was not the fastest ship ever and only did 20 knots normal. She was capable of higher speeds but the fuel consumption simply became unacceptable with an unacceptable vibration and noise level coming from either her shafts or her propellers or both. 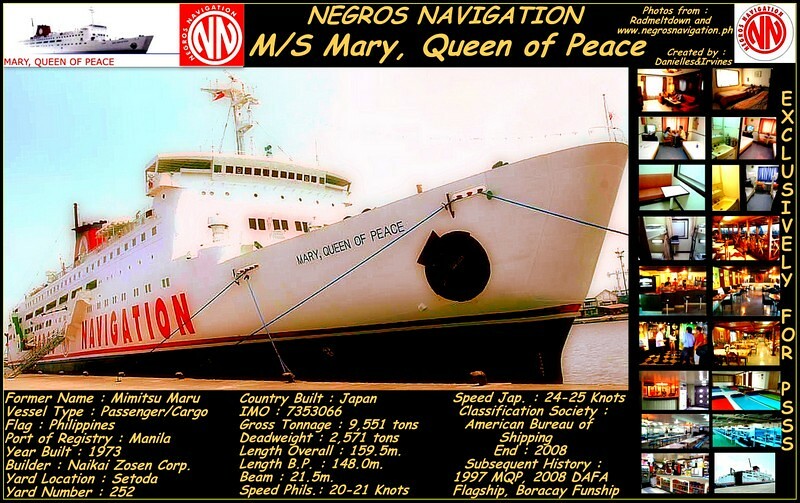 In terms of official Gross Tonnage and in over-all length (LOA), “Mary, Queen of Peace” was the biggest and longest-ever ship of Negros Navigation. However, she was not recognized among the great liners in the world in the book of Frank Heine and Frank Lose, both of Germany, because officially she has less than 10,000gt, the cut-off. This was so because among liner fleets locally Negros Navigation was the most aggressive in using the “magic MARINA meter” which downsizes the gross tonnage of the ship so less will be paid in registration, docking and towage fees. To think the smaller “SuperFerry 2” and “SuperFerry 5” both made that honor roll. None of the Negros Navigation ships was included in that book. “Mary, Queen of Peace” was considered by many as the flagship of the Negros Navigation fleet although I am not sure there was a formal announcement of that. 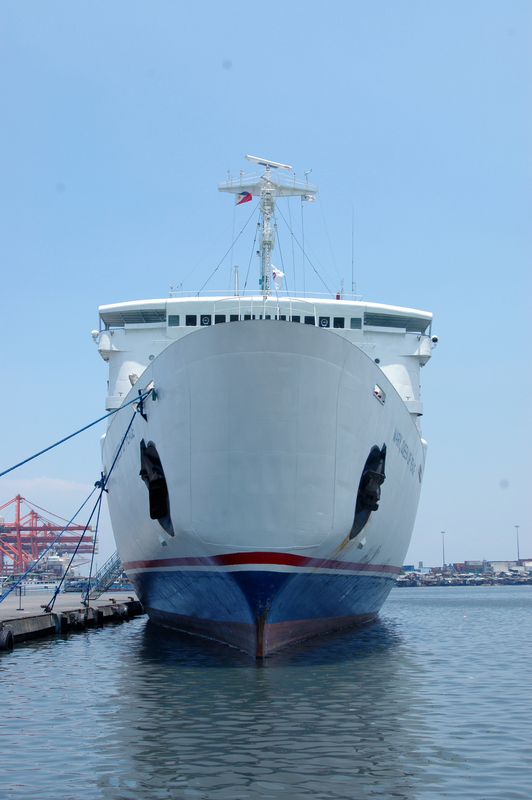 When I sailed with her she was doing the Manila-Cagayan de Oro route for Negros Navigation. It was a wonder for me why she was doing that route since it was known that from either Iloilo or Bacolod, the passenger or cargo traffic of Negros Navigation is not great and she has a big passenger and cargo capacity along with huge engines and fuel bill. 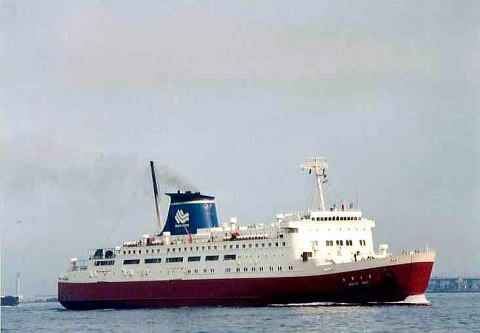 “Mary, Queen of Peace” was born as the “Mimitsu Maru” of Nippon Car Ferry in 1974 with the ID IMO 7353066. She was built by Naikai Shipbuilding in their Setoda yard in Japan and was completed on February of 1974. She was 159.5 meters over-all with a moulded breadth of 21.5 meters and a depth of 8.5 meters. Her original gross register tonnage was 9,551 and she then had a passenger capacity of 774. She had a load capacity of 84 trucks and 120 cars. She was powered by two Mitsubishi-MAN diesel engines and her original service speed was 26 knots. Her engines had a consumption of 116 tons per day at average speed. In August of 1997, she was sold to Negros Navigation which was then in fast expansion and opening new routes and with gimmicks to boot like the free “dancing porters” plus shuttle buses to ferry passengers and tie-ups with bus companies. The chair then of Negros Navigation, Daniel Lacson, was also the chair of the Philippine National Bank and so it seems loans were easy. In that same year I also had a cabin mate from the old William Lines who happened to be a cargo manager. Aside from extra food I was treated to free discourses on shipping. He almost predicted the demise of Negros Navigation since he said it is cargo that makes or breaks a route and a shipping company won’t know if one is viable until about one or two years. He said a route will always begin in losses and Negros Navigation was opening many new routes all at the same time. He said it is difficult to pry free the old customers and shippers. I know that from personal knowledge as old customers enjoy much less valuation charges or in cubic meter measurement and has freebies to boot like free tickets. In the Philippines, the superstructure of “Mimitsu Maru” remained basically unchanged in the conversion to being “Mary, Queen of Peace”. Her gross tonnage however went down to 7,610 and her declared net tonnage was only 3,482 (from the original 4,285) However, additional passenger accommodations were added and bringing her passenger capacity to 2,158 persons. One thing one readily notices in the ship is her very large center funnel. In the country only her rear quarter ramp was at use and it was located on the starboard near her transom stern. “Mary, Queen of Peace” also had the bulbous stem, one of the first to have that modern feature that reduces resistance as it slices through water thus lessening the fuel consumption. As usual for Negros Navigation ships, she had three different kinds of Suites plus Deluxe Cabin, Business Class, Tourist, Travellers, Tatami and Budget classes. Only the last is non-airconditioned while the Suites and Cabins have a cabin assistant aside from the usual own lounge and TV set, free linen and toiletries aside from its own restaurant. In Negros Navigation I also like the Tatami class as I like lying at floor level without taking off my shoes (I don’t know but I always fear losing my shoes in a ship). Besides I only lie down when I am already dog-tired and sleep little since I want to soak everything and maximize the experience. I reason I can anyway get plenty of rest and sleep anyway when I get home. 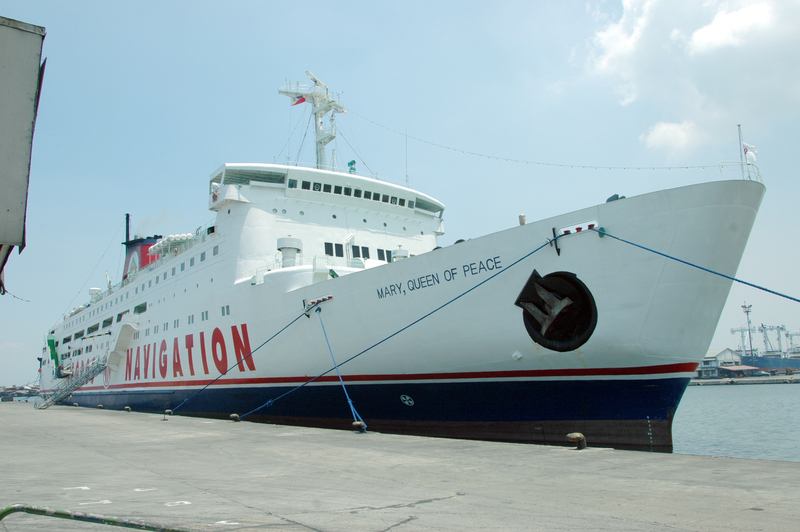 In the last part of her life, “Mary, Queen of Peace” was also known as the Boracay Fun Ship and served as a floating hotel for Boracay passengers. By this time she was one of the few ships still sailing for Negros Navigation when the company was already illiquid and under court receivership and under the direction of “white knight” Manny V. Pangilinan who came to the succor of the company so it won’t go under. In the sell-off of Negros Navigation ships to whittle down debt I always had the fear that “Mary, Queen of Peace” won’t survive. With the pressure of the intermodal transport and the budget airlines the passengers were beginning to thin and cargo was no longer growing especially with the advent of regional container ships calling on provincial ports. I thought with her thirsty engines there might not be enough revenues to sustain her. Not long after, she was sold to Indian breakers and she was broken up on January of 2008. She was part of a succession of Negros Navigation ships sold off to breakers in order to pare debts and to cope with the reality of a declining liner business. Now, she is just a memory.